Influencer marketing has massive impact on selling disruptive products and selling disruption. Frequently, it’s the best way to bring disruptive technology to the world. In this show, you’ll hear from Warren Whitlock, the leading expert on influence marketing and on embracing disruptive technology to create better outcomes. I met Warren Whitlock through friends of friends who said that we needed to meet, the very best kind of introduction. And the reason why is because Warren is a disruptive influencer. Warren is best known for writing the first book about Twitter “Twitter Revolution,” where he explained how mobile technologies and social media would revolutionize marketing and business. And the world now considers him as a technology visionary. He is ranked by the Consumer Electronics Show as one of the top 100 tech influencers. And he’s my regular breakfast buddy where we swap stories and dream of the future. Mark S A Smith: I met Warren Whitlock through friends of friends who said that we needed to meet, the very best kind of introduction. The reason why is because Warren is a disruptive influencer. Warren is best known for writing the first book about Twitter called Twitter Revolution where he explained how mobile technologies and social media would revolutionize marketing and business. Now, the world considers him as a technology visionary. He’s ranked by the Consumer Electronic Show as one of the top 100 tech influencers. He’s my regular breakfast buddy here in Las Vegas where we swap stories and dream of the future. 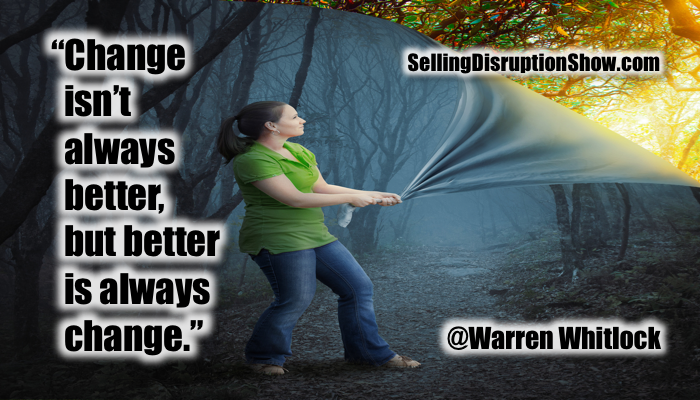 Welcome, Warren, to the Selling Disruption Show. Warren Whitlock: Hi, glad to be here. What a pleasure. Mark S A Smith: Thank you. You have helped people disrupt their markets by simply connecting with people who have influence and start talking about it. How did you get started in that? Click here to download the PDF now. Mark S A Smith: Yes, beautiful. Warren Whitlock: Boy, I must have heard that some place or whatever. Best I know, I came up with that on my own that day and solved that problem, and years later, I started thinking about it. I went out on a research now because that was in the 70’s. Now, I researched it, think about what I said. No one else is quite saying it like that. I’m claiming it as my own. Even if somebody else said it, it was independent. Mark S A Smith: Warren, that becomes the show meme. Warren Whitlock: Yeah, it is. It’s how can we make things better if we hang on to the past. People call me a futurist. I’d rather look at what we can do based on the facts we have at hand today rather than worry too much. You can learn from the past, sure, because those who don’t study history are deemed to repeat it. I’m constantly looking for something to change. I want the world to be different. I want it some kind of life-changing experience everyday. Philosophically, that’s where I’m coming from. Let’s get into the online stuff. Warren Whitlock: Yeah, I’ve only been online since 1981 and done a little bit of everything. Owned a tech company that we were repairing particularly printers but all computers. Got involved in all sorts of things and watching what’s coming forward. I like the PC industry early on before I even got into it because I could look a company growing fast. I remember Osborne Computers went from nothing to, I don’t know if they went public, but they went huge. They were building a campus to nothing in a matter of what seemed like months as a kid reading InfoWorld from afar. I said, “That’s my drive. That’s what I love,” is that kind of stuff. When I got a chance, I got into technology and did that, always looking for the next thing. Mark S A Smith: Well, I think, Osborne is a really interesting example because at one time, they were the number one computer manufacturers of personal computers in the market. Then they killed themselves. I just called it the Osborne effect where you introduce a new product too early and people stop ordering your current products and you ran out of cash. They were disruptive and then disrupted themselves, bad, bad, bad, bad, bad. Mark S A Smith: Crossing the chasm. Warren Whitlock: That’s the one, yeah. The chasm comes and Osborne wasn’t able to cross the chasm. Had they had the funding to stay alive until the end of that, they would have gone on. There’s also a lot of other things I learned about it. I had dinner with employee #4 one time who is Coach Carter who is now best known for a movie with Samuel Jackson about when he as a rich guy decided to coach a high school basketball team in Richmond. Mark S A Smith: The dog years and the internet years are one and the same. Warren Whitlock: Right. I’m not sure if that’s fast enough. Mark S A Smith: I don’t think it is either. Warren Whitlock: Tom Peters wrote in the 90’s about, we called them the nanosecond 90’s. Tom is good at coming up with terms like that and said, “We need to not just be catching up with change, we need to be pushing change or we won’t be changing fast enough.” I now call it getting out in front of the bleeding edge and running fast enough so the bleeding edge doesn’t catch up with you. One more, Ray Kurzweil talks about singularity and the machines are going to become smarter than us and that prediction is in late 20’s. We’re looking at little more than 10 years off. Now, when you hear him speak, it’s not about what machines are going to do or whether that’s going to happen, what date it is and how do you define singularity. There’s a whole lot of topic you can talk about that, but really what he’s teaching is use the new technology. Grab on to it as fast as possible. Use it so you can keep up so you communicate with those robots that are going to take over and be smart. By takeover, we mean, we’re going to give them assignments and they’re going to do them for us. It’s more task than stealing our jobs. Mark S A Smith: Absolutely, and the way that we see that happening, of course, is self-driving automobiles. Here in Las Vegas, we have a self-driving tram that will take you up and down Fremont Street now. Right now, because of concerns, we have somebody that sits at the control panel but they don’t need to touch that. The reality is that autonomous cars are way smarter than any of us. Warren Whitlock: Right, and getting smarter exponentially fast. Mark S A Smith: That’s right, it’s truly exponentially fast. Warren Whitlock: That’s what people don’t get when they say, “I’ll never give up to the car,” as some metaphor for so many things. You say, “I’m not going to be able to give up driving. I don’t trust the car.” Well, cars right now are driving like a 16-year-old, they just got their license. Mark S A Smith: Yes. That’s well said. Warren Whitlock: They’re going to get better in months and then that’s going to grow and grow and grow and then there’s a network effect. You take Moore’s law and Metcalfe’s law about networks, that the more nodes you add, the smarter it gets and you see that’s just growing like crazy. There’s only a couple of years the cars will be so smart, that way you’re going to have to start talking about human drivers getting into the way. This is not an example of cars. This is about how fast things are changing, technology alone is going to dwarf any of that. When we really get good at building materials … Think carbon nanotubes and we’ll leave that for a different day to discuss. The exponential growth coming from that is going to dwarf Moore’s law. That’s how I got into disruption 10 minutes later to answer your question with. If I’m not out trying to push and try something new, I’m not moving fast enough. Mark S A Smith: That’s right. Two quick comments on cars. One is we have self-driving cars that are 16-year-olds but they don’t check their social media. They’re actually better than 16-year-olds. The second thing is that when people say, “You know, there’s no way I’m going to get in a self-driving car.” I say, “Well, you get into an elevator all the time and it knows where it’s going and you don’t seem to mind getting on an airplane and releasing control.” It’s going to just be a matter of time before you step in a car. The reality is the self-driving cars are going to be substantially better than you can drive. They don’t get distracted. They can see twice as far as you can. They can predict things to a much higher degree of satisfaction and they are never distracted. Mark S A Smith: I cannot wait for self-driving cars. I mean, as much as I love to drive, I actually hate driving more than I love driving. Warren Whitlock: I would say one of the great intersections of Las Vegas where you can pull out a phone and type an email and wait for the light to change and then move forward a few feet to go again. On a very busy three-light intersection and it dawned on me, “That goes away with self-driving cars.” They’re going to be smart enough to talk to each other, assess the situation and drive right through the intersection without stopping, both directions on existing roads. I don’t know what we’ll do about designing roads in the future and how fast we’re about to do that, there’s a whole lot of stuff that needs to get done. We’re going to spend our time creating what that is and directing what we want it to be and at some point, who knows where the robots take … If the robots take over and kill us off, there’s really not much we can do about it right now. The only safe play is to move. We’re getting along with them and doing as best as we can and assume that we’re a long ways off from robot having consciousness, or it’s more likely to be we’ll be cyborgs. We’ll have more and more of the technology hooked up directly to us. Is that to seal the human race? Who knows. Mark S A Smith: I expect for that to happen in my lifetime. I expect for my children and my grandchildren to have bionics implanted. Hey, they have no problem with tattoos and piercings, and bionics are going to be a natural extension of their bodies. Warren Whitlock: Think ocular implant. They’re already doing that. Warren Whitlock: We’re both wearing corrective lenses. We could have get by without that. I put contacts in my eyes and I don’t have to worry about changing them, washing them, doing anything. I just see better now and that’s without the surgery. That’s actually technology added right on my eyeball. If I can stomach doing that which by the way was tough at first, I can stomach sticking a piece of plastic on my eyeball and living with it there. I was saying, “Laptop on every desk back then. Now, 20 years later, all those kids are holding a cellphone when they’re in class.” When my kids went to high school 15, 20 years ago, they were being told, “No, don’t bring that phone to class. You can get suspended for a pager,” and all the evils that it could be and now, imagine every high school student is carrying a smartphone. I don’t know but I’m just imagining. Mark S A Smith: Let’s talk for just a moment about the future of humanity against artificial intelligence because we’ll be seeing that bursting on the scene more and more even this year. I believe that the way we’re going to get along with artificial intelligence is to treat it like another customer. How do we create value for the AI? I can look at an AI as I do another individual as far as it will have some needs and I will figure out a way of creating commerce with that AI to fill its needs. Well, that may seem a little far-fetched, my friends, you’ll come back to this podcast, to this show and 10 years and go, “My golly, Mark, you had something there but we had no idea how to grasp it.” I think you get that, my friend, as one of the futurist and a visionary in my world here. Warren Whitlock: Right. Compare that to Google and SEO. We have been feeding Google what the algorithm wants now for 15 years. Mark S A Smith: That’s right. It’s still learning from us. Warren Whitlock: Google is closer to 20 years old but I’ll say 15 years where they became dominant and everybody like started creating the webpages for that. A lot of people, and boy, if I had a lot of arguments on this, a lot of people thought, “Well, we can find the glitch in it and feed something and we can get rich off of that,” and some people did get rich. Mark S A Smith: But temporarily. It’s not sustainable. Warren Whitlock: Yeah. The algorithm gets smarter and smarter. We just had a discussion yesterday about a new domain name, a domainer was trying to sell the TLDs, the top-level domains. Instead of dot-com, there’s now hundreds of those and my comment was, “The algorithm doesn’t need that anymore. By the way, it’s sending it to an IP address which is a number. The domain names are just there to look pretty for us.” Google has years ago lessened the importance of having the keyword in the domain. You can do just fine without having a keyword domain. Obviously, it’s better, it’s easier to type in that’s because humans are still typing it in. What happens when we get to a point we don’t need this? My comment was these top-level domains are interesting but the future is not learning more dot-com-like phrases. Dot-com is what we call it, and that will go away at some point then we’ll just say, “Computer, I need this.” Imagine on Star Trek, them going up and asking for a website to their computer. They don’t. They don’t need a mouse. They don’t need a keyboard. They just talk to the computer and the computer knows. We’ve got to be pushing forward and thinking about that. Started looking … Looked in Craigslist, got responses like, “Well, we’re kind of busy but we’ll stop by when we can. It will be a couple of days.” You’re like, “No, I don’t like that guy.” He’s not dependable. He said he would come and then came back and said it would be today. I don’t want the guy that’s the lowest price. I don’t want the guy that puts 27 asterisks in the title so it rises above everything else in alphabetical order. That’s not the guy I’m looking for. I’m looking for a human being that I can get to know, like and trust. I really like to start a relationship with somebody that could come and fix my car. Same for my dry cleaners, same for where I buy groceries. Yeah, sure I want the technology. I want the groceries delivered to my house. I’m taking a serious look at whether or not to have a car. I’m in the suburbs of Las Vegas. It’s hard to get by without a car but I’ve got friends with cars. Mark S A Smith: You’ve got Uber and you’ve got Lyft, and we’ve got autonomous cars coming down the road very soon. Warren Whitlock: Well, those are my friends with cars. That’s what I’m saying. It’s a joy for me to pay a guy $5 who gets a little bit extra income, drops me where I need to be and it’s a pleasant conversation 99% of the time when you get in the car like that. I used to worry about, “Well, hey, I should be on my phone or doing something,” actually no. I need that 5, 10 minutes with another human being learning about the world and what’s coming and what they’re doing. The last Uber ride I took was a driving instructor. Talk about a safe ride. The guy who teaches driving and when he’s in between appointments, he drives for Uber. He’s filling in the gaps. I’m filling in the gaps. We’re all like using things more efficiently or finding out that we only need a car for every two or three houses even though everybody wants to have a ride when they need a ride. Well, Uber fills that in. I’m not saying Uber is a total future, but definitely, we’re getting to where we fill the gaps and there’s so much profit in that and it’s cost-saving and we get to a point where we can take care of the homeless, the needy, get them up to the point where they have enough self-reliance to want to take care of themselves and guess what, that’s not a cash handout. That’s people taking care of people. When we get to that point, the influence just becomes so important. Let me give you a little bit of hard number so we stick to the sales and business part of what we’re talking about. Major corporations investing in influencer marketing on average are spending less than six figures which is nothing compared to media budgets and other ad agencies and things like that and they’re seeing 10 times the return they do off of spending money on advertising. Over time, mass advertising is going to go away and we’re going to see more recommendation from a friend when you want to buy something. A lot of money being made in setting all that up and then, of course, some of us influencers get to where we have a large enough audience that we are somewhat like media. Biggest mistake I see there is people thinking that because I have 500,000 Twitter followers, they can buy access to those people. No. They can work with me and I can consult them. I can decide I like them and then I can talk a lot about that. We can create a video and then we can promote the video and it’s on my site, not theirs. Whenever I’m promoting something, I’m not looking at my site. I’m looking at somebody else’s site. Can I lend credence to what you’re doing here by being one of your interviewees? Can I promote it? Can I send more links and traffic to it? Gets you better known because the rising tide lifts all boats. We started looking at things beyond just, “Hey, how many transactions can I have today?” Hard for smaller businesses to do but big businesses started giving, started to spend some money. I expect to see that doubled and tripled on the next couple of years. That’s what influence is. It’s power networking. Putting some marketing dollars behind it, all of a sudden, I can go out and find a podcast who’s passionate about my topic. I can pay them very little compared to what I paid for other media and then I can use my network, my connection to amplify what they’re doing. Using this podcast as an example. When it gets done, I can go out and amplify it, make it your most listened to episode ever which is great for my reputation and yours and there’s potential business for it but beyond that, then people will say, “Oh, what’s he doing?” See, he’s talking about good things, talking about the future without talking about how I can make a buck directly off of it. The transaction today when you start planning like that, pretty soon, you’re giving that same Moore’s law effect then things are just going like crazy. That’s why I have so many followers because of few relationships one at a time. There’s one list that shows I’m a top 10 social media power influencer. Well, what that means is that nine people who I considered to be famous, Guy Kawasaki, Robert Scoble, Chris Brogan. Seth Godin is number 10. I’m number 9. Mark S A Smith: Congratulations. Warren Whitlock: Gary Vaynerchuk … The names you know in social media with the exception of Seth who I met once online, the rest of them are people I know, I’ve worked with, I’ve sat next to at a conference. I’ve had dinner with them. They’re people I know. That doesn’t mean I go to them and say, “Hey, I’m trying to get Mark’s show listened to. Will you pump it for me?” No. To those people, I say, “That’s a really interesting piece you wrote. It’s really interesting how you helped that company. They come back and look at my stuff and say like, “Oh, man, this podcast might be interesting.” They listen to it and they share it because that’s kind of people they are. Mark S A Smith: That’s right. They share for sharing sakes. They’re all givers. Every one of them are givers. Warren Whitlock: I’m an influencer and that I know a whole lot of influencers. Mark S A Smith: Yeah. Give me some examples of some influence campaigns that you put together for people. 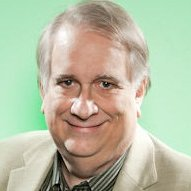 Warren Whitlock: Well, we’re working on one now for organizedchange.com and the guy running it is David Chaudron who is like super smart, have been doing this for 30 years, great consultant. Online in his website, it’s not going to win any design awards. It’s out there. It does okay. I’m setting up and sending people to that, making introductions like, “Before we recorded this, I’ll talk to you about him. This is a guy that needs to get known more.” What happens one by one, not only do we get the links in the SEO value and the blah-blah-blah, the technical what we need to do where it feeds the monster or feed Google. Mark S A Smith: You got to feed the monster. Warren Whitlock: Yeah, but besides that, we’re making the introductions. Now, he’s going to be on somebody else’s podcast. I think we also talked about The Bacon Podcast this morning. The Bacon Podcast with Brian Basilico and man, I’ve been on his podcast. He’s been on mine. We’ve been friends. We went to a conference in Denver. Suddenly, we’re best friends. Of course, we had bacon together. When I have a chance, when you ask, he’s somebody that I want to mention. IBM, we work with. They have a different way of doing things because they’re IBM. It’s all about where they can reach in the enterprise and a lot of times, IBM employees just like shock me with how little they know about the rest of their company. It’s not that they’re dumb. To a person, everybody I’ve met working with at IBM, super smart, focused, has goals that are bigger than, “How can I get this task done today,” great people. All have interests outside of IBM that are interesting to talk to them. Mark S A Smith: Yeah, that’s been my experience too. It’s just so big that way and they really get into the analytics of watching who does what and we could see instantly when we shared a tweet how many people were retweeting it, how many people were replying and talking about it. I won when it was about how many conversations I got started and a couple of my colleagues were able to blast something out and their people are trained just to retweet everything and that worked really well. On several different levels, we could tell which ones were working and which ones were not. By the way, the people at that top all were people that wrote Twitter books. Mark S A Smith: Interesting. Warren Whitlock: I’m sitting with the other two of them and I’m saying, “You know, with us three, we represent most of the Twitter books ever bought.” The same might be true if I wasn’t in the conversation because I was talking to #1 and #2. My book sold 10 times as many copies as we expect it. We didn’t expect it to be a general book. It was establishing me as knowing something about social media. We put the name Twitter on it because we knew back in 2008 that Twitter was going to be especially a disruptor. Mark S A Smith: That’s true. We’ve seen how people are trying to downplay it. It’s still extremely disruptive and I meet a lot of people through Twitter. It’s extraordinary. Warren Whitlock: Well, you can have a short conversation with somebody. Warren Whitlock: …Which leads to other conversation, breakfast, lunch and well, we attended the trade show together. We’re looking to doing some business in that area because we’ve been to a couple of things together. Ultimately, I’ve got a friend and now, here we are talking about business on a different level. Here, it’s always growing that network and nothing we’ve done gets wasted. When I tweet, it’s average of about 4,000 right now, read that tweet. Mark S A Smith: Wow, that’s massive. Warren Whitlock: Yeah, but that’s only 1% of my audience. I get to talk to them again and again but I don’t even care about that because the average tweet, I’m answering one person. The way Twitter works when you start it with the @ symbol, the only people to see that is the ones that follow both of us. That could be 12, that could be 100. It doesn’t matter because it just takes one. My favorite example of that is Conan O’Brien. Late night TV, NBC dumped him in the whole Jay-Leno-quit-and-then-came-back thing and he’s over at TBS and I don’t watch channels so I just don’t recall. He’s over there and he decided in his time off to follow one person. That one person had a very good reach. If she twitted something, Conan read it, all of the sudden it can go out to tens of millions. It’s not about how many followers you have. It’s about what connections you have. I would guess that five years later that she’s not a powerhouse giving ideas to Conan. That was her choice. Mark S A Smith: That’s fantastic. Warren Whitlock: That he referred me to because he knew me well enough to know that I know what I’m doing and then could make that referral. This morning I’m working on another gig like that where a friend that I was talking to at a conference a couple of weeks ago said, “Hey, here are some people who might need some help.” It’s looking to be another easy six-figure and ongoing relationship that comes just from me taking the time to meet a guy who I already knew who happened to be coming to Vegas, come to a show. Mark S A Smith: To summarize this, really influence marketing is about creating conversations with people who are experts in their area by trading favors, by trading information, by trading access and by trading influence. It’s all about … Really, it’s about creating a community of trade. Mark S A Smith: Yeah, The Psychology of Persuasion. Warren Whitlock: If anyone listening has not read that book, drop what you’re doing, go get that book and your life will change for the better. Mark S A Smith: Also, I will put a link on the show page where you can get it. Yeah, you must read that book. You must. Warren Whitlock: You must have to do that. You’ll be in sales, marketing, business or anything dealing with human beings, you need to read that and study that book. Cialdini’s very first example on the first law that he talked about which is reciprocity and that means I do something and then somebody wants to do something. His very first example is a little thing where they put two students in a room. They paid them both to be there but they were there waiting for something. They make it a 15-minute waiting situation, two people in a room. They test it that at some point about five minutes into the conversation, he’d get up and say, “I’m going to go down the hall to get us soda. Do you want one?” Test that against not doing that and the payoff was five minutes later asking them to buy raffle tickets. They got these raffle tickets. They’re $5. You can win a car. I’m going to get a blah-blah-blah if I meet my quota. Same pitch later, the return on that was by buying them a 50-cent soda, that was the price at that time, 50-cent can of soda. They were getting $5 on average over the group of people they tested it on, more than they would have got if they didn’t do the soda thing first. Unrelated, one happens five minutes in the conversation, the other one happens 10 minutes into the conversation so that they’re seemingly unrelated to the subject. It showed an immediate ROI on doing it, double the amount of raffle tickets sold through that group. Mark S A Smith: No, that doesn’t work. Warren Whitlock: Quid pro quo doesn’t work the same as reciprocity. Mark S A Smith: Actually, there’s not a hope in hell. I don’t send out Christmas cards. I haven’t my entire life, I don’t see myself starting at 58 but that said, I’ll probably send you a e-card. Warren Whitlock: No, again, this experiment, of course, so that it’s even relevant that we know what we’re talking about. I send out thousands of Christmas cards at one time. I got sales off of doing it. The card did not say I had a special. It did not have a, “We love you as a customer.” All it was, “Merry Christmas, Warren and the crew at…,” that was it and send it out. Mass produced cards, mass mailed them. It worked. The reason that it works is because it wasn’t an ad. It probably wouldn’t work if we send out an ad in its place. You bring up the important point here, it doesn’t work on everybody. If you’re doing it for, I need to figure out what I need to do to get Mark’s attention, then yes, whether or not I send a Christmas card or a gift or whatever, remember your birthday, it mattered. Today, we have so many avenues to go and you can testify that won’t work. Warren Whitlock: I know for sure that when I retweet something that you have on Twitter, they even know about it. There’s other people where it’s automated and I just don’t bother. I get a lot of good things to tweet from people who are sharing things and they’re just ignoring it. If I need to cut their name on that, that’s okay because they’re not going to notice one way or another. They still get the credit of the retweet, they just don’t notice that I’m commenting on it. I don’t bother to reply and say, “I saw what you were posting. It’s really good, I’m sharing it with people.” I’ll do that if it’s somebody like you because I know that will get your attention, you’ll notice and it will create the warm feelings and everything. We’re not saying throw out testing and the old mass marketing principles. Those are still there but today, if I’m selling something to somebody, the very first thing I’m going to do, find out if they have an active Twitter account. Retweet something they said, maybe make a comment there. It has nothing to do with selling or even saying it’s an introduction to me. They don’t know whether or not I’ve been following them 10 minutes and then do something nice for that person. I call that the social media love because really, it’s not costing you anything. As soon as you spoil it with letting them know it’s about your sales process and people are smart. We have really good BS detectors on this kind of stuff. If I walk into a car dealership and a slick salesman comes up and offers me a cup of coffee, I know why he’s doing that. Now, if he talks to me at a Chamber of Commerce meeting about my views of the future, I’m more likely to buy a car from him. I walk into his dealership and he offers me a cup of coffee, reciprocity isn’t there. It still works by the way. They’ve tested it and it works. Offering a beverage when somebody walks into your business certainly works but not near as much as it works when we’re out and about and have a casual conversation and I offered to help. Warren Whitlock: Where it really has to be disconnected is in your head. You got to decide, “I’m going to do good for people because I know my sales are going to go up.” I was in the laser printer business and we started selling refurbished printers, highly profitable, great business for a set of time. Taking business machine, putting them in the back and service for the home office or whatever, tremendous market. Email didn’t work quite right. We had a LAN and we could send email internally but getting it out to the rest of the world was a kluge. We had to go around certain things and I ended up just taking a computer that was in for nothing except for outbound email. I had email on my machine through a modem or whatever and then we had another machine that the employees could use. Every once in a while I just go in there and start answering support questions. We had a completely unrelated support site called laserpage.com. You could find it today. You won’t find much current on it. I own it because I’ve had it for 20 years. People would go there and ask a question, “Hey, I turned my printer on. It always worked but now, it won’t. It might be important that I just installed a new version of Windows.” Yeah, back in those days, we needed a new driver when you got a new version of Window. They would ask and I had the What To Do About Drivers? We ended up supplying drivers free. For $9.95, we would put it on a floppy disk and mail to you along with a couple of other things. I remember the whole process was 16 pieces by the time we mail something to them. They got a flyer and a thank you and a sticker on the envelope and things like that. It was quite the process we did but we had this set up. We were doing better than breakeven on sending out dozens of those a day but we’re doing them as a service. Here’s the side note. Somebody would say, “Printer won’t print,” I knew exactly what to tell him. You start by finding out if the printer makes a different noise when you turn it on. This has no power or whatever, then you know it’s the printer. The printer seems to be working, you do a self-test. After the self-test, you check the cable. After the cable, you check the connection to the computer and the drivers and you work backwards like that. I put that in four paragraphs basically what to do and a lot of people decided that was too much for them to do and would call us, because at the end, it says if you need any more help, here’s the number to call. I would send out those kind of messages. There were probably 10 different things that were common answers and the rest of them were, “Thanks, I really appreciated your article on this. Thank you.” I would answer those people. I’d do that anywhere from 10 minutes to an hour, a couple of times in a week and I was pretty flaky. I’d do it and then not do it for a month. When I would do that consistently for a few days, sales the next week went up. That’s usually why I stopped doing it. We were getting so busy that answering people that were buying the refurbished laser printer, things were good or I’d go off and do something else. Today, I systematize that. I make sure a person was working it and of course, today, it would be arriving on everybody’s desk and have a support ticket system but just paying attention to people, I never could connect the dots. Like you say, it’s got to be separate. It’s going to be you’re doing good because it’s the right thing to do or smart. We know that will help business but you got to have that kind of altruistic, I’m going to do this because I know it’s the right thing to do. I know it’s good for my business. I know it’s good for my customers. Mark S A Smith: Fundamentally, what we’re talking about, Warren, here is disrupt by being good, by doing good. Just that easy. Warren Whitlock: Yeah, there you go. If you want to systemize that now, today, there’s things … Contact me, I’ll show how it’s done. The way that we’ve turned the funnel on its head and done things in a different way, but you can take this and just have that attitude of I’m going to spend five minutes or an hour or assign a person to do this that everyday you’re doing things that improves the world instead of every email saying, “Will you buy from me?” Now, the emails are, “Hey, I listened to your podcast. It’s pretty good.” Then, you’re making a human connection because that’s the one thing technology can’t take over in the future. Mark S A Smith: That’s right. 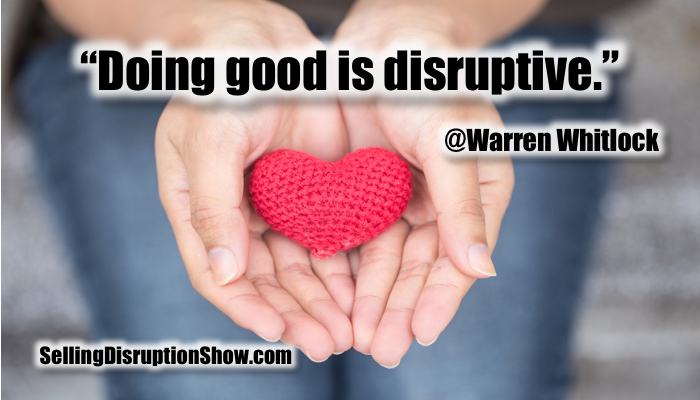 Warren, this has been an absolute delight to have you on the Selling Disruption Show. Tell me what do you suggest that our listener does next. Warren Whitlock: Well, for certain, if you’re still listening and this resonates, follow me. I’m @warrenwhitlock on Twitter and just about everybody else. Drop me a note if you have a question or you think that there’s something a particular business need you have. Ask me a question in public because then others benefit from it and they see our conversation and it’s really good to have a tweet to your name from somebody that has 450,000 followers. Mark S A Smith: That’s right. Warren will answer you. Warren is very good at answering. Also, I suggest that you pick up a copy of Warren’s book, the Twitter Revolution. I’ll have a link on the show page for you. Thank you so much, Warren, for joining us and sharing your insights about creating relationships that influence and by pointing out that doing good is disruptive. Want to Read the Rest of the Transcript? 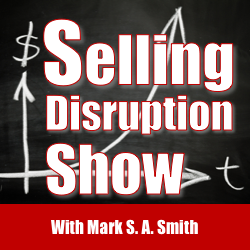 Get Instant Access: We'll show you the rest of the transcript and give you a PDF (A $2.99 value) in exchange for your email address and permission to send you updates about the Selling Disruption Show and our sponsors. You'll hear from us weekly, unless we take the week off. Here's the deal: We will NEVER share your contact information with others because sometimes, sharing is not caring.